Janmastami Celebrations - We Need YOUR Help! ~ The Toronto Hare Krishna Temple! Janmastami Celebrations - We Need YOUR Help! 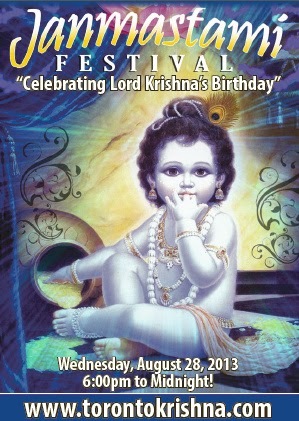 The countdown begins for what is the BIGGEST festival we celebrate every year - Sri Krishna Janmastami! On Wednesday, August 28, 2013, the Hare Krishna Centre will be celebrating Janmastami in a grand fashion. There is so much activity packed in one night and it requires a lot of planning beforehand. It's not an easy task trying to pull off such a huge festival and that is why we need YOUR help! Every year, we rely on the generous time many give up to be part of the celebrations. We need help in various areas like maintaining the crowds, organizing the shoe area and prasadam (vegetarian feast) distribution. If you have some time to help, please fill out the form below. We hope you can join us for this most auspicious occasion! Where will the parking be, last year we got $40 ticket. What time is last darshan before midnight?